Runnerd proudly displayed on my car. I linked you in my post today. A friend bought me a 10k sticker afer I completed it in Sept. I hope to replace it with a 13.1 someday! Great job on the streak! 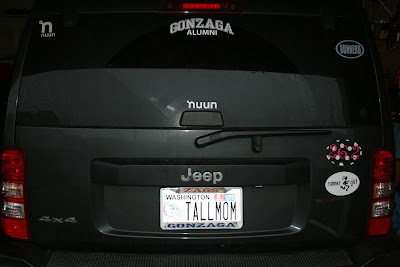 I have a runnergirl sticker and a USAT sticker on my SUV, but that's it. I used to have a 26.2 sticker, but felt like a fraud because it had been a few years since my last marathon, lol. I have a 13.1 sticker, hopefully it will be joined by a 26.2 and an Ironman sticker in the future! I'm with Ken... PACKER stuff! and a 26.2 emblem and a runner girl sticker. I love pulling into the parking lot for our weekly Sole Sisters group run - all the cars look like that! Love it! 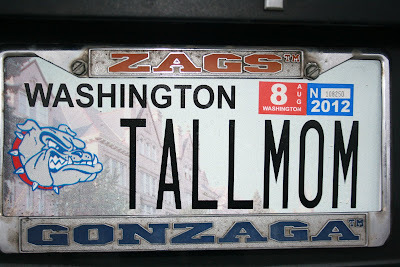 I have zero Runner stuff on my car--just my Stanford License plate frame! Looks great on the Jeep! LOVE IT!!!! I have a 26.2 sticker on mine! NOt yet, but I'm hoping after my first half, I'll be sporting some runner LOVE! I love your car stickers...shows you're one, proud RUNNER...and a dang good one at that!